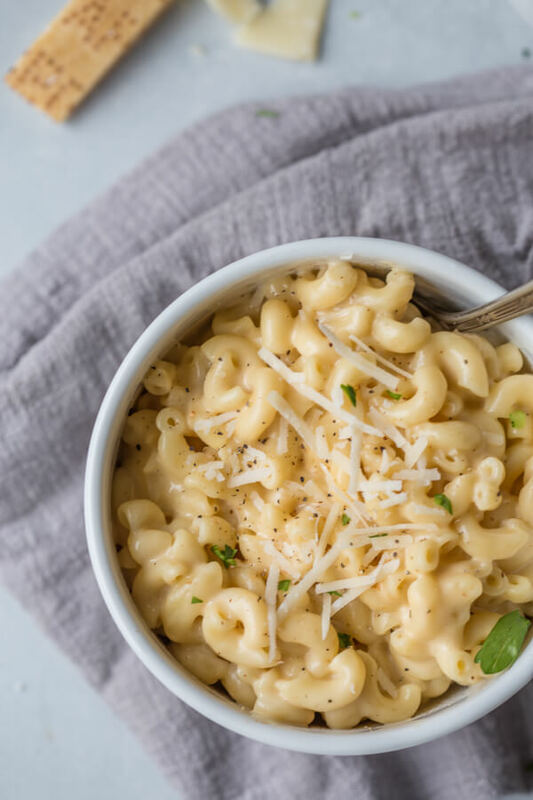 This is the BEST Instant Pot Mac and Cheese! Made extra creamy with a secret ingredient plus sharp cheddar & parmesan cheese. 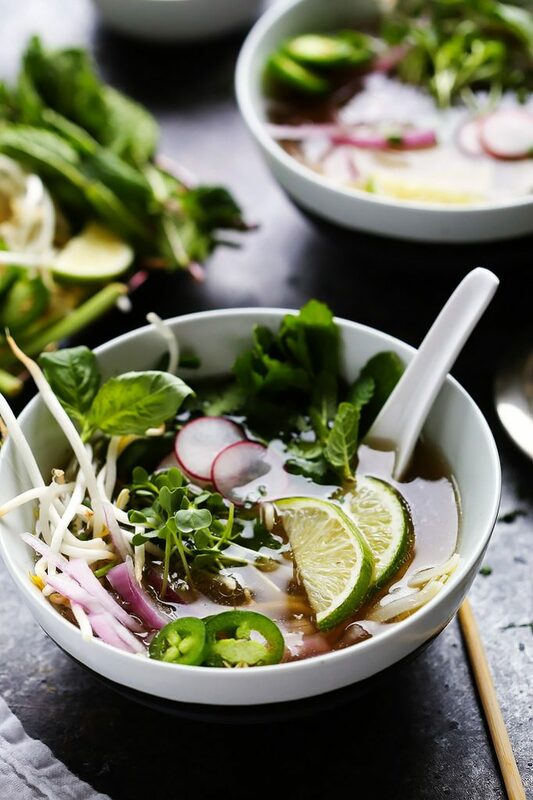 It can be made in just 4 minutes with your electric pressure cooker. I’ve been excited about my Instant Pot for quite a while now… I can honestly say that I use it at least a few times a week. 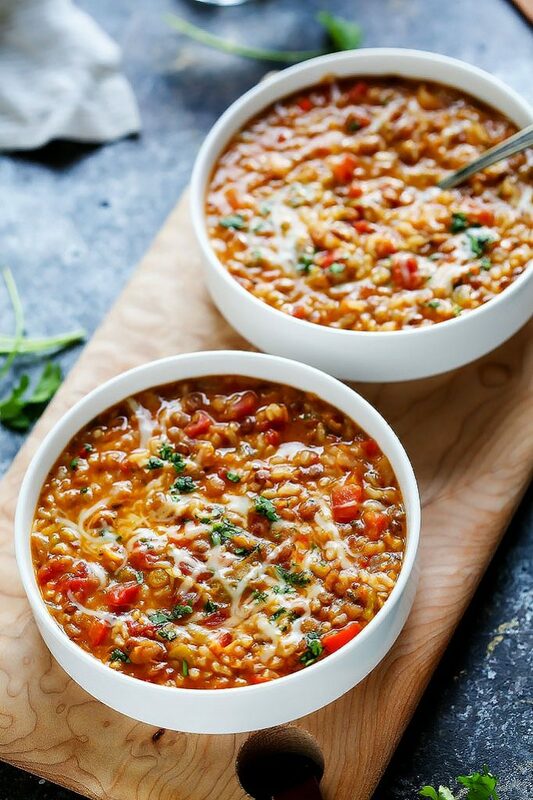 This Cheesy Southwestern Lentils & Brown Rice dish made in the Instant Pot makes a regular appearance for Meatless Mondays, I use it to make bone broth (much quicker than my previous slow cooker bone broth), I even use it to reheat leftovers, since we don’t have a microwave. But my excitement reached a new level when I found out that I could make Instant Pot Mac and Cheese in under 15 minutes from start to finish! And this Mac and Cheese is good! I’m just going to throw the statement out there that this is the BEST Instant Pot Mac and Cheese. Really, this is just the best macaroni and cheese in general, even trumping my prior favorite, this Creamy Macaroni and Cheese with a Potato Chip Crust. I’m using a familiar secret ingredient from that recipe… Evaporated milk. Evaporated milk is essentially thickened milk, which means there’s less liquid in your dish and instead it’s just really, really creamy. 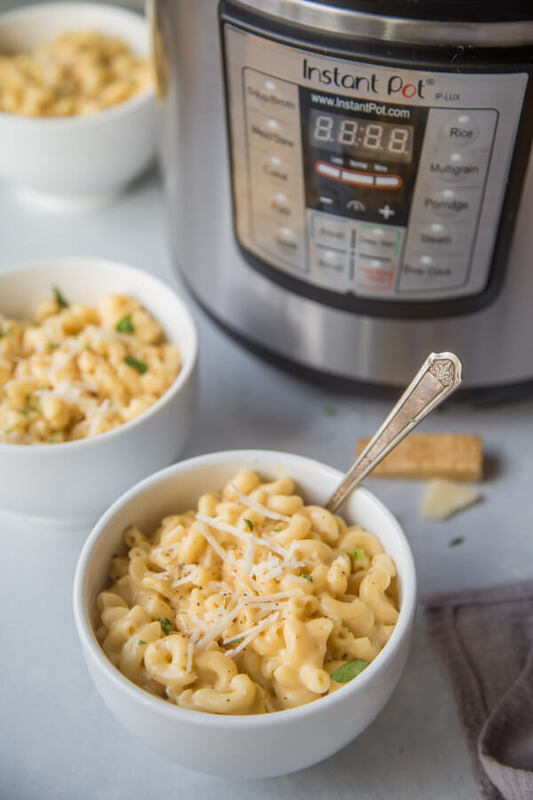 I love how it blends right in and thickens this Instant Pot Mac and Cheese to the perfect consistency, along with that sharp cheddar cheese and parmesan cheese that lend the perfect tangy, cheesy flavor. Other than that, I kept the seasonings really simple… I added in a couple teaspoons of yellow mustard (we all have some of that sitting in the refrigerator door, right?) and some nutmeg. The flavoring is really subtle and I made it that way for a couple reasons. Number 1: I wanted the flavors of those amazing cheeses to shine through – You can really taste the sharp cheddar and the parmesan in this dish. And, Number 2: I figure that a lot of you may be cooking this dish for your kids. They won’t be able to pick out any crazy flavorings going here and they’re going to love it. 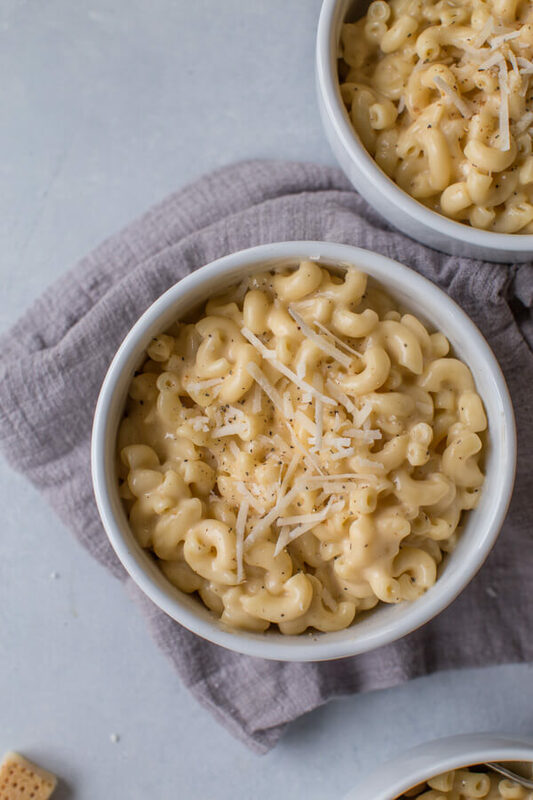 This is just plain and simple (and the BEST) Instant Pot Mac and Cheese. One of my brother’s favorite dishes, and basically the only thing he ate growing up (besides my Nana’s Sunday Gravy) was mac and cheese from the blue box. But, sneak some black pepper in there and he wouldn’t even touch it. So, I say, if you’re cooking this for kids, feel free to mix things up a bit. Maybe they won’t like the sharp cheddar and parmesan… So use mild cheddar instead. Maybe they’ll even gawk at the mustard and nutmeg – You can totally leave them out too. Mix the macaroni, water, mustard, and salt in your Instant Pot. Close and lock the lid of the Instant Pot. Press “Manual” and adjust the timer to 4 minutes (or half the time on the macaroni cooking directions). Check that the cooking pressure is on “high” and that the release valve is set to “Sealing”. When time is up, open the IP using “Quick Pressure Release”. Stir the pasta to break it up. Add the evaporated milk, cheese, butter and nutmeg; stir until completely incorporated the and cheese has melted and coated the pasta. Season to taste with salt and pepper, then serve immediately. Try an off-dry Riesling with this Instant Pot Mac and Cheese. The slight sweetness of the wine balances out the salty cheese and its bright acidity refreshes your palate. Looking for red wine to pair with mac and cheese? 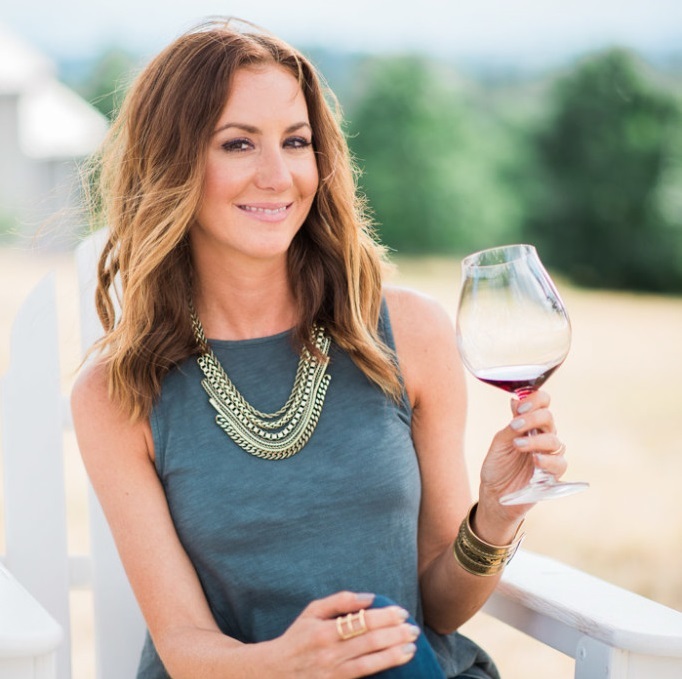 Try a Lambrusco or Spanish Grenache. Both are light-bodied enough to not overpower this dish, and their ripe, juicy flavors, make a great match for this rich, cheesy dish. My kids would love this! Think I’m finally going to jump on the IP bandwagon and get one for Christmas. When I do, I have to try this! Instant Pots are great!! Never thought to try using ours with pasta since I don’t eat most grains but that is SO fast, tempting! Great idea to use instant pot for macaroni and cheese mix. Looking really delicious and tasty. 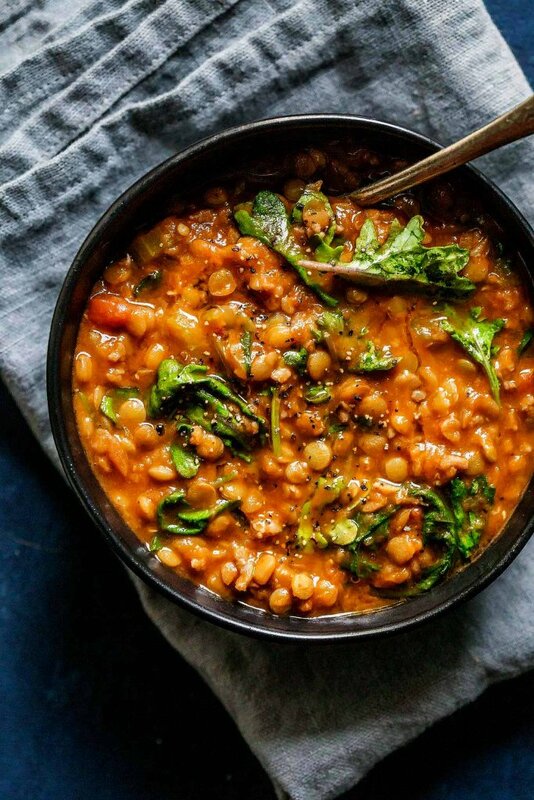 The more instant pot recipes I see, the more convinced I am that I need to get one. Four minute mac and cheese is right up my alley. The world is going crazy over Insta Pots these days! I can’t bear to get one more kitchen appliance, but maybe I should reconsider. Yum! Would I need to add more cooking time if I double the recipe? Hi Shannon – The cook time should remain the same. It may just take a little bit longer for the pressure to build in the Instant Pot. Worked perfectly! I halved it cooked same time and only used cheddar. Do you know the reasoning for using evaporated milk vs regular milk? I don’t always have evaporated milk on hand so wanted to know if I could sub regular milk in that case? Thanks for the recipe! Hi Erin – You could definitely sub in regular milk, but maybe use a but it will be a bit more watery, and not so creamy. I would maybe start off using a bit less of the regular milk and see how that works, then add more as needed. Hope this helps! Once the pasta is cooked, do you drain the excess water before going on to the next step? Hi Melinda – I’ve found that it’s not necessary to drain the water. Once the cheese is added, the consistency is perfect! However, if you feel there’s too much water, feel free to drain it before adding the cheese. 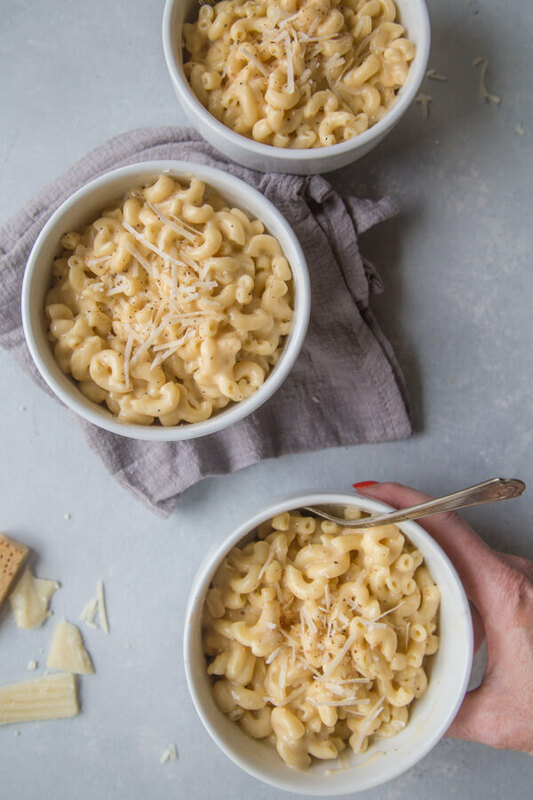 I’ve been looking for a good Instant Pot Mac & Cheese recipe, and yours looks yummy! Quick question, do you need to drain any of the water prior to adding the milk/cheese/spices? Some recipes I’ve been reading with similar ingredients specify draining the water and others do not. Thanks! Hi Katie – I found that the amount of liquid left at the end of cooking was just right, especially once the cheese was mixed in. However, if you feel that there may be too much liquid, feel free to drain that out before adding the other ingredients. Hope this helps! I made this tonight and it was super good! My boyfriend suggested we put some of the boxed crispy fried onions on the top to add some texture and is was amazing. We will definitely make this recipe again. Thanks. 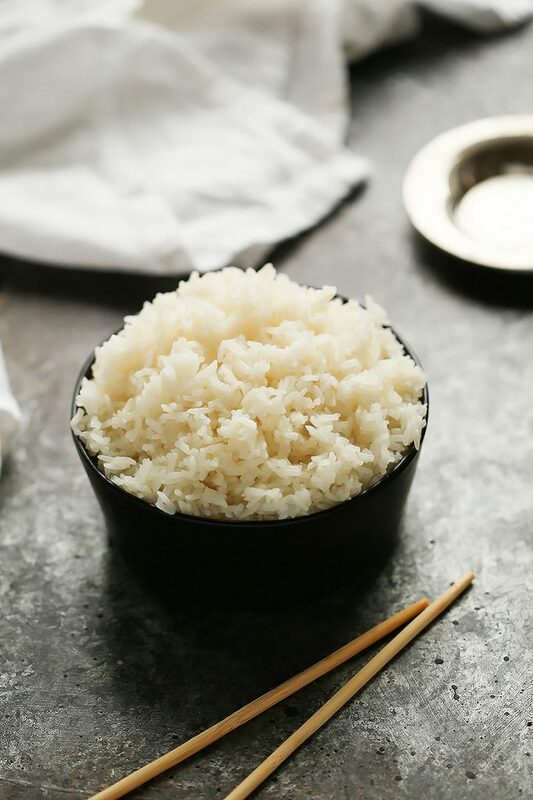 What size pot is used for the majority of your recipes? I want to buy one but not sure what size I should get. Hi Rebecca – I have the 6-quart Instant Pot. This was delicious!! My kids said best mac and cheese I’ve made yet! Can you clarify if it is mustard like the condiment or ground mustard? I used the “condiment” mustard and it came out fine, but just wondering. Thanks! Hi Cindy – I used prepared yellow mustard as well. Just revised the recipe to reflect that fact. Thank you! So glad that you and the kiddos loved it! So glad you liked it Amy! I don’t have elbow macaroni can I use any pasta? You sure can Natalie – Just be sure to adjust the cooking time (half the time of the original cooking directions). Hope this helps! I’m going to double this recipe tomorrow in my 8qt pot. Do you think I need to add another minute of time. Seniors lunch tomorrow and we have 8 pre schoolers coming too. We are having pizza, mac and cheese and a big salad. Covering everyone I hope. Will let you know how it goes over. Hi Kris – You should be able to leave the cooking time the same. It just may take a bit longer for the pressure to build. Hope this helps! Just made this for dinner tonight. My kids loved it! Followed the recipe exactly! Thank you! So happy to hear that Joe! SO glad to hear that you liked it Debbie! Mine came out too watery too, even after adding the cheese it wa too soupy. So I put the Instantpot on sauté and kept stirring (no walking away) and then added a cornstarch slurry. Thickened it right up so its creamy but not soupy. It was really tasty! Sorry the chickpea pasta didn’t work out – That’s good to know though! Loved it! Instead of 4 cups of water I did 2 cups water, 2 cups chicken stock, I used Dijon instead of yellow mustard and added a dash of cayenne. SO flavourful. It was a hit in our house! So glad you liked it April – I like your substitutions! So happy to hear that you liked it Tabbie! Absolutely delicious and easy to make. Followed directions to the letter and the result was perfect! Hands down, the best! So glad you enjoyed it Laura! This recipe really nailed it! At first, I couldn’t understand why yellow mustard in the cooking water? Thank you for sharing that little secret! Truly kicked up the flavor, without any taste of mustard. I had a little bit of liquid after cooking the pasta, but I didn’t drain because I always add 1/2 cup pasta water to my old recipe. Did I just write old? You bet I did, because I’ll never make it again! It’s this recipe from here on out. Awww – Thanks so much for the kind words and the feedback Debi. 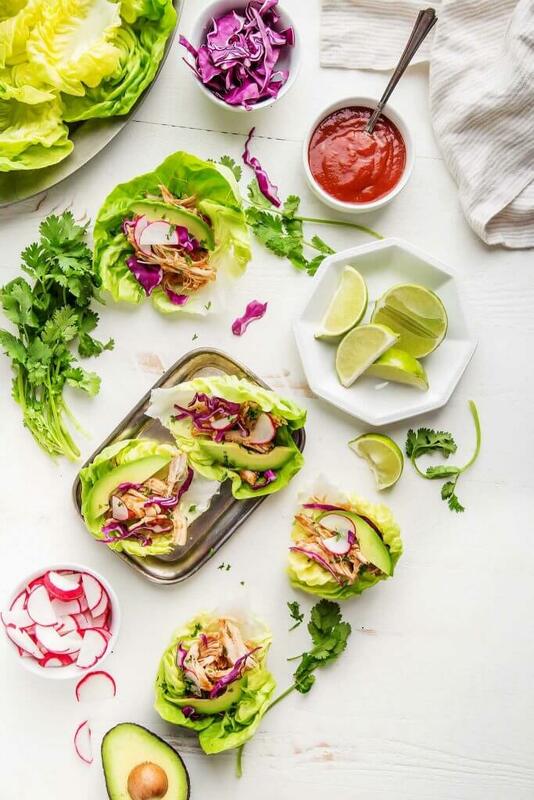 So happy to hear that you loved this recipe! I keep messing up one thing. Do I wait for the Instant Pot to warm up? I am so new that I let off the steam too soon. What are the things I need to look for before I actually let the steam out? Hi Susie – The timer should go off after the time is up. It will take a while for the pressure to build, then the steam valve will pop up. Then the countdown timer will begin. When the time is up, you can release the pressure. Hope this helps! Just made this. I thought it looked like a lot of liquid after cooking but once I stirred in the cheese and let it sit for a minute or two it was nice and creamy. This recipe is a keeper. So glad you liked it Connie – Yes, there does seem to be quite a bit of liquid at first, but the cheese melts in and then it thickens a bit as it sits. You should notate for users with a 3qt that you need to use the natural release and not quick release because of the high starch content…. I had to put the valve back to sealing after thick liquid started spraying everywhere with the steam. Hope the recipe turns out okay. This sounds great and I want to make it tonight! How much cooking time should I add if I want to add diced chicken to it? Hi Leslie – I think you would need to cook the chicken first, otherwise the pasta will become way overdone. I would sautee the diced chicken in the pot, until it is good and browned. Then add the pasta and cook for the 5 minutes. I’d also do 10 minutes natural pressure release rather than immediately releasing the pressure. Hope this helps! Made this today with a bit of a tweek as I had no nutmeg, and Kraft Cheddar & Swiss mix cheese. My husband says it is quite possibly the best Mac N Cheese He’s ever had! Thanks! I will be printing this recipe out and adding it to my Go-To IP recipes! So happy to hear that he liked it Gina! I love that you put nutrition information, but I can’t figure out how large each serving is. Any idea? Hi Kaitlyn – I would say that each serving is about 1 1/2 cups. Thank you so much! I’m going to attempt a Gluten Free (GF) version shortly. Do you need to adjust the time if you’re using whole wheat macaroni? How do you think this would turn out if I used heavy cream instead of evaporated milk? Hi Lisa – I think the heavy cream may be a bit more watery than the evaporated milk. You could maybe adjust by using less of it. Excellent recipe. I didn’t use nutmeg (not a fan) and subbed in dijon mustard, but otherwise made as directed. It’s so easy and just as good as my old go-to recipe (which involved making cheese sauce, boiling the pasta, baking, etc.). I love that this takes only one dish and is super fast. Thank you! Is there a rule of thumb for adjusting the time based on the type of pasta? For example, if I use einkorn whole wheat pasta (which would take longer than regular white elbow pasta to cook the traditional way) how much time would I need to add in the IP? Thank you! Looking forward to trying this! Hi Abby – You should adjust the time to be 1/2 of the cooking instructions on the package of pasta. Hope this helps! This was delicious! Definitely not an everyday meal if you’re watching your calories, but a great treat and good old comfort food. Also — super quick and easy. I didn’t have any yellow mustard so I used about a teaspoon, maybe a teaspoon and a half, of ground mustard. Yum yum! My six-year-old had four bowls. I may try to adapt this to make it with cauliflower instead of noodles for a (slightly) lighter version. Thanks for the recipe! So glad that you and your kiddo liked it Cat! I’d love to hear back if you give it a go with cauliflower! This macaroni is good as is, but takes it to a whole other level if you cook up some diced bacon and onion before hand, and then stir that in when you mix everything else together. That sounds like an amazing addition Amanda! This looks delicious! I need to make Mac and Cheese for 25 teachers. How do you think this would reheat? I am not sure I could make enough at one time for 25 people so I would have to make it in batches. Maybe triple the recipe in the Insta then transfer it to a crockpot on low while I make more tripled recipes?? What would you do? I doubled the recipe in my 8 qt Instant Pot, as written, for a family gathering. It turned out great! So little hassle, and great flavor. Its definitely best when served immediately. So happy to hear that you liked it Reese! After doubling, is it still half the time and comes out completely cooked? Same time to double the recipe. Would the IP keep this warm for a few hours? It will Maria, but it definitely looses its texture a bit. I much prefer it right when it’s finished cooking. This was the first recipe I tried in my new IP and it was a total bust😫. I didn’t realize that in order to cook on manual (mine button doesn’t say that so after much research learned it is pressure cook) the pot has to first reach pressure. It took 5 minutes to teach pressure before starting the 4 minutes. I used quinoa noodles which still weren’t done after the timer released, so I put it in for 1 minute. It took 7 minutes to reach pressure this time! The whole process took 17 minutes and my noodles were mush. Even without having to cook it a second time, it still would have been just as fast to do it on the stove top right? Is this user error? I’m confused since I thought a 4 minute meal was only 4 minutes!! I’m sure your macaroni is amazing but I’m making it on the stove top now. This was amazing!!! I actually used shredded Grueyer that I had on hand (a lifetime ago I worked at The Melting Pot and that’s what we used for all the fondue) and I added Garlic paste as well. It was all perfect! I was nervous about having excess water, but there wasn’t any. I served it with shrimp! It will definitely be a regular in our house! Your add ins sound amazing Emily! Love that!!! Hi! I making this on the 4th of July and would like to leave it on Keep Warm mode so people can just come and eat when they want. Do you think I should add more of a liquid? Also, I do plan on tripling this recipe if that helps. Hi there! 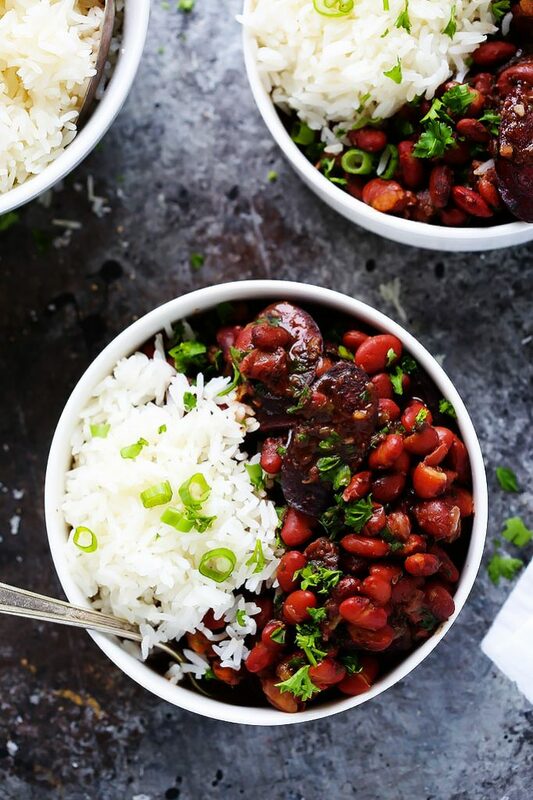 I’m planning to make this for a pot-luck, and was wondering if I could double the recipe in a 6-qt instant pot. Will it fit?? Hi Jayna – Yes. I believe that you can double this recipe in the 6-quart! Hi! I am tripling this recipe for fourth of July and wan t to keep it on Keep Warm so people can eat whenever they want. Do you think I should add more liquid?? 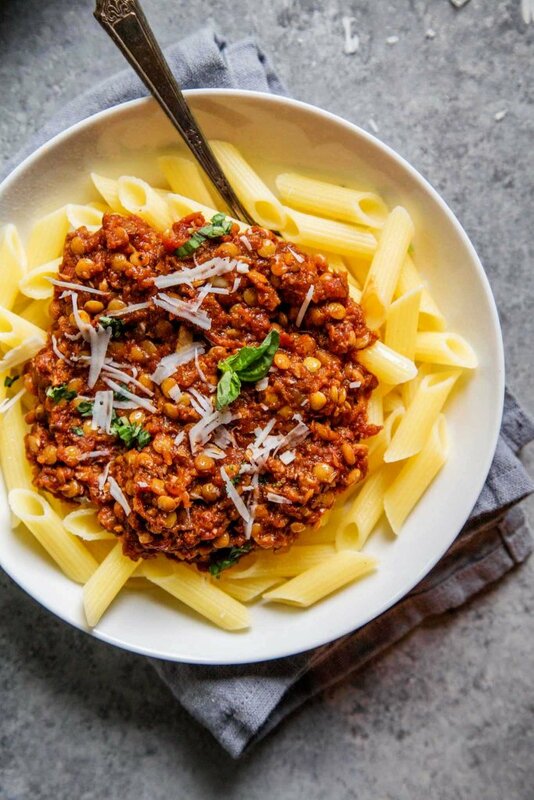 Hi Natalie – I don’t think you’ll need to add more liquid, but I have found that unfortunately the macaroni tends to loose its “bite” when it’s left in the Instant Pot for an extended period. I definitely prefer it freshly prepared, but I think you’ll be OK. Hope that helps! Hi Erin. I never got to make this Mac and cheese for the grandkids when they were here, so Grandpa is having it tonight! It’s Hatch green chili time in Four Corners, so I chopped up several fire roasted Chile’s as our grownup addition. That sounds like an absolutely amazing add-in Marlene! WHEW! Too sharp and too cheesy for us! First time ever using IP for mac n cheese. I will just use the standard, no mustard, no fresh parmesan and just one cup of shred cheddar next time and see if it is bland enough for us old folks. I like old fashioned southern baked mac n cheese but don’t know how to make it. Every attempt with out new IP is like a science experiment. Sorry you didn’t like it Krystal! I don’t find the sharp cheddar to be overpowering in this mac and cheese, and definitely don’t taste the mustard… I hope you are able to find a recipe that you love… Perhaps you could just swap out the sharp cheddar and parmesan in this recipe for colby jack or mild cheddar? I love this recipe! It’s been a staple for our house since school has started. Have you ever tried freezing it? I’m wondering if it would keep? Hi Liz – I’m so happy to hear that you love the recipe. Unfortunately, I don’t think that it will freeze well. even heat and easy cleanup. This is soo good and simple! I made it tonight for a potluck. Zero effort! Maybe my pallete isn’t refined enough , but the nutmeg ruined this for me. This is the only mac & cheese I will make from now on – just as quick as the box but SO much better! I agree Emily – It’s my favorite! Mustard and nutmeg in Mac and cheese?? Doesn’t sound appealing.. I just made this and it was amazing! Definitely not overpowering and the nutmeg makes it DELICIOUS! I’ve seen in the comments that others have found it soupy/watery but I feel that it is the perfect consistency. It is definitely not a creamy recipe but the longer I left it on the warm setting of my IP I noticed it became thicker (15 minutes warm setting). Personally, I love my mac and cheese as a thinner consistency so this recipe was perfect! We love this Mac &Cheese. I have probably made it 10 times over the last 6 months. Sometimes we’ll fry up a pack of bacon and throw it in after the cheese is melted. It’s super good as well. That sounds like a GREAT add in Tara!